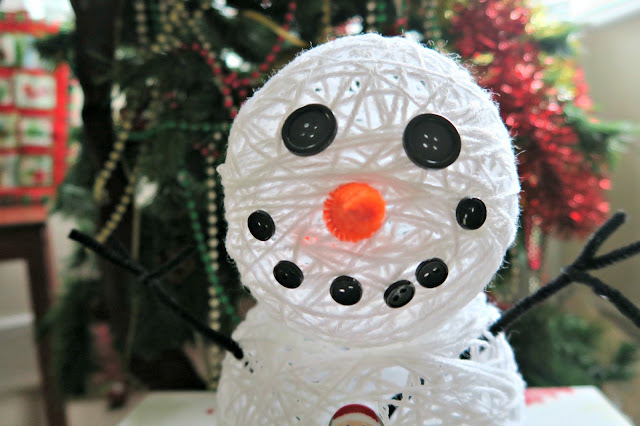 In October, we made Halloween pumpkins using yarn, balloon and glue so I was inspired to create a snowman using the same method. 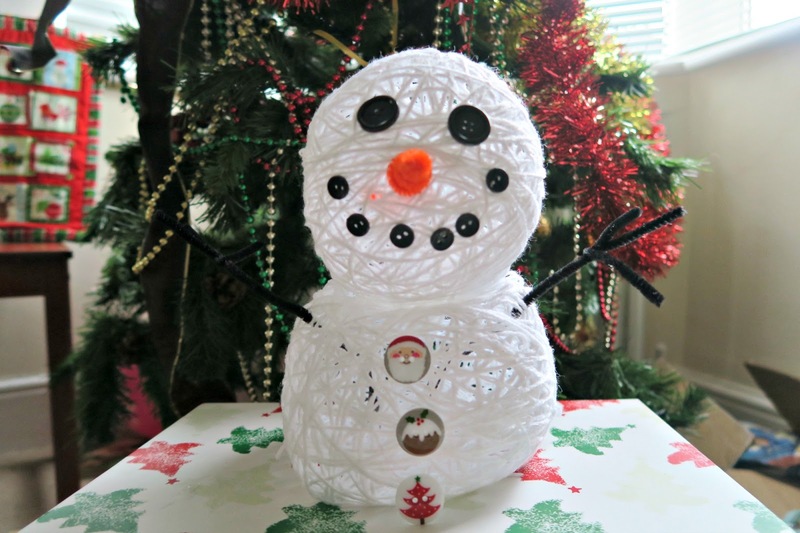 To keep this project quick and simple, I decided to create two white yarn balls for the body and head of the snowman. The first step is to blow up the balloons to the preferred size. I then always tape a coin to the base because find it helps the balloon from rolling around while drying. The next step is to create bundles of yarn. I wrap yarn around my hand around 10 times and create about 10 bundles before starting to glue. I put some liquid glue with a splash of water in a bowl. Next started dipping the yarn into the glue. I would suggest not to soak the yarn to highly. I always make sure that the end of the yarn piece has a good dab of glue but otherwise I only lightly soak the yarn. I find that when you are wrapping the yarn around the balloon that glue will quickly spread out along the yarn and on the balloon shape. It is better to have yarn that feels a little sticky instead of really wet. The wetter the yarn the longer it takes the ball to dry too. 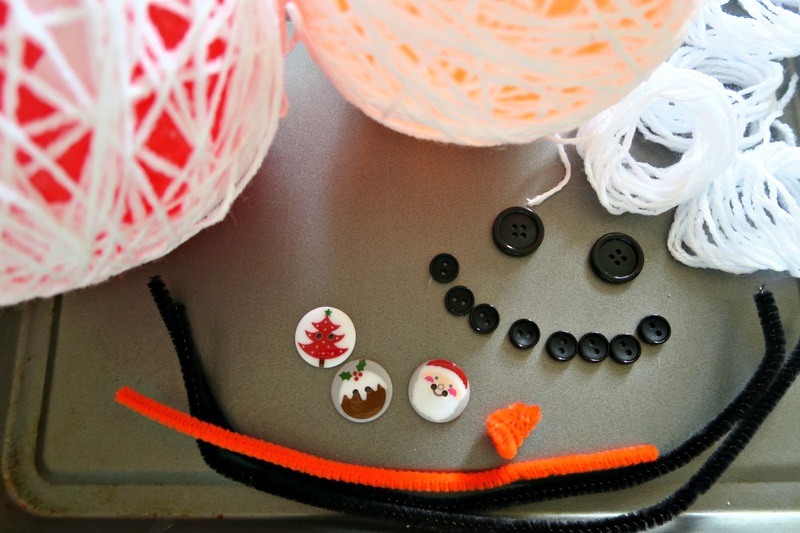 You can always had spots of glue directly to a section of the balloon if the yarn is not sticky to the other yarn. I keep a couple baby wipes near by so I can wipe my hands between gluing and cutting more bundles of yarn. 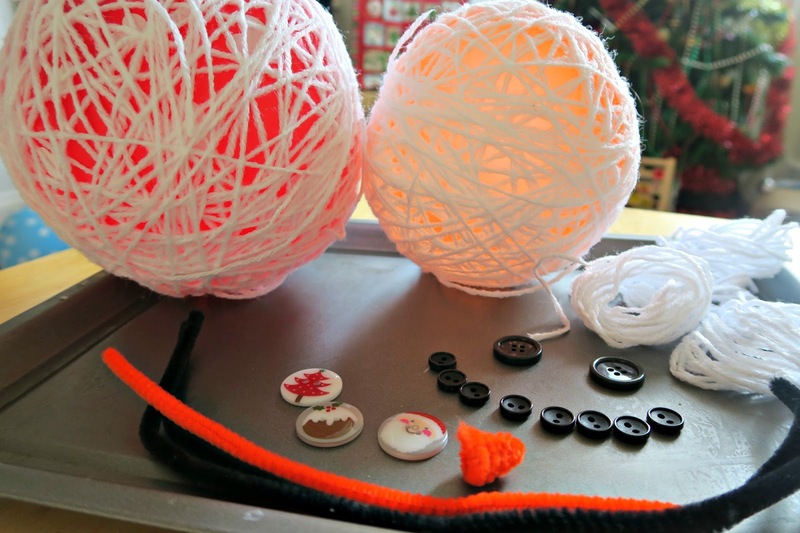 Keep wrapping yarn in different directions on balloon until it is mostly covered with yarn. Let it dry a couple hours or overnight so the ball of yarn is really stiff. My daughter loves popping the balloon. My toddler son helped me choose some buttons for the snowman's face and body. 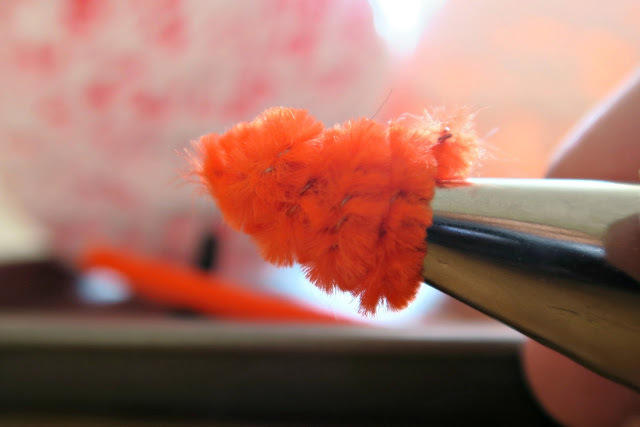 The nose was created with using an orange pipe cleaner that I wrapped around a metal icing tip. Black pipe cleaners were perfect for stick arms. I loved the cheeky snowman but in all honestly he does have an issue. I wrapped enough yarn around the head ball to create a very stiff ball but his body needed more yarn. It is rather floppy and he is having issue standing up. I could have either re-inserted a balloon and blew up to allow more yarn to glued on or I choose to stuff white tissue paper inside the body ball to give him additional support. Putting tissue paper inside the balls are also a suggestion to keep the round shape while storing between festive holidays. A thank you again to Wynsors for the slippers and craft supplies. 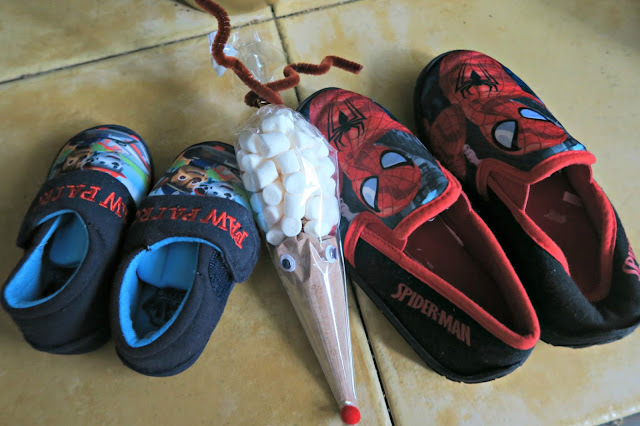 If you want additional ideas for Christmas crafting, Wynsors has published a fun article titled "How to Keep Kids Entertained over Christmas". Check out #CraftsWithWynsors for more crafting ideas.